Surge protectors are devices which offer protection to electrical appliances against spike voltages. They work by limiting the amount of voltage supplied to an electrical device. This is achieved by either blocking or grounding unwanted voltages above a secure threshold. These electrical devices are installed in process control systems, power distribution panels and communication systems among other high-voltage industrial applications. They protect surges and spikes caused both by electricity and lightening. 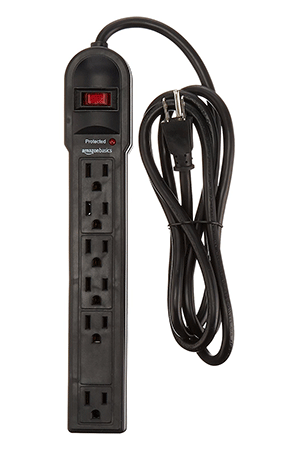 Tripp Lite SUPERB7B comes with 7 outlets and a 84-Inch long cord which provide a seamless experience while making bulk connections. It also features LEDs and a right-angle plug. The former provides allows you to monitor the protection. The later allows you to save more space for your furniture. The surge suppression rating for this unit is 2160 joules. This is enough to handle power surges within your home appliances. It takes care of your computers, peripheral devices and other electronics. It is designed with three suppression modes namely; common and normal line surge suppression. This protectors comes with a noise reduction feature. This serves to protect your hardware and data while ensuring optimum performance. Cyber Power CSB300W has a suppression rating of 900 joules making it ideal for hime and office use. It comes with three outlets and a wall tap. This comes in handy where many devices require protection. It can fit in small spaces not meant for macro surge protectors and long cords. 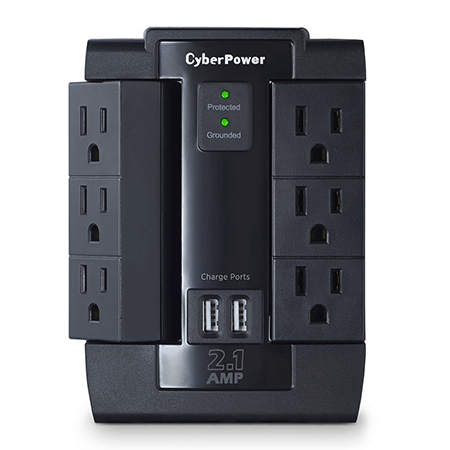 Cyber Power Essential takes care of routers, personal computers, cable modems and other electronics. A wall tap allows for direct plug-in which increases convenience. It comes with the MOV technology used to safe guards electronics against power surges from power abnormalities and lightning. This surge protector allows you to safeguard your equipment against damage due to power fluctuations and involuntary shutdowns caused by power interruptions. It also features EMI noise filters which prevent electromagnetic and radio interruptions which cause data loss. 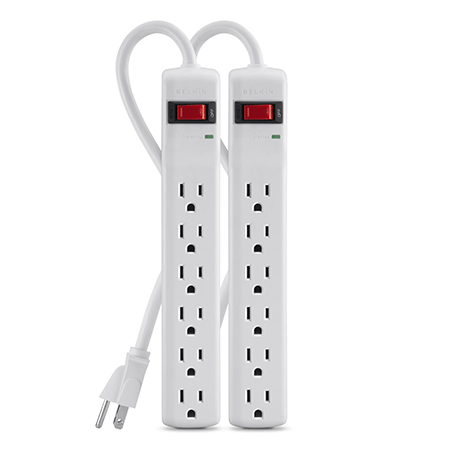 This surge protector comes with charger ports which are used to charge compatible mobile devices. A 2630 joule suppression rating provides safe and reliable protection. It takes care of power interruptions from electrical lines and lightning. This protects the electronics you use everyday. It is designed with Arrest P8U2 technology which ensures protection against detrimental power surges and spikes. This offers convenience and reliability to your electronics. 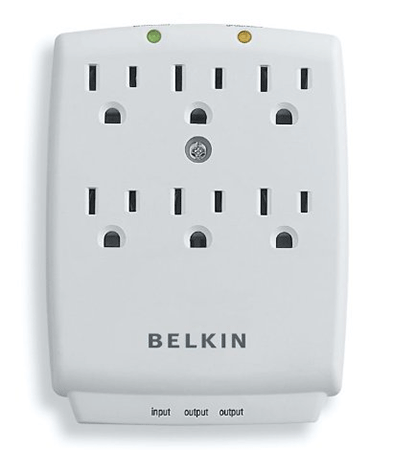 It features 4 transformer spaced and 4 regular outlets. The former are meant to be used with large plugs. The whole unit is easy to install given the right angle plug and a 180 degree power cord. It also features EMI/RFI noise reduction feature which protects radio and electromagnetic interference. There are 2 LED indicators which signal wiring problems and onset of surges. 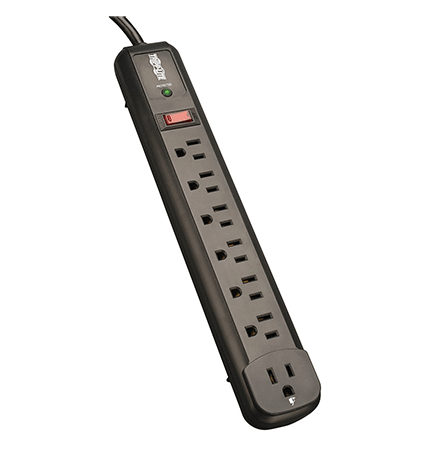 This 600 joules surge protector comes with a 72 inches long power cord. It offers enough protection to your personal equipment against faulty lines and lightening. The power cord offers more flexibly while making connections. It comes with a swivel head plug which saves more space. It features mounting holes on the back which allow you to place the unit on the wall. The on and off switch is very rigid which eliminates accidental dis-engagements. This flat surge protector provides enough room for plugging in as well as placement of covers and closures. TLP74RB protects your equipment from surges which occur frequently. It comes with a noise filtering technology with protects your appliances against damage, performance problems and data corruption. This ensure data integrity and optimum performance. This surge protector is rated 1080 joules which provides protection for all valuable electronics. This is base on both normal and common suppression. This is an illuminated unit with LED lights which indicates surge protection. It features six 5-15R right angled outlets and another one which accommodates a bulky transformer. Connections to a distant wall outlets are enabled by 36-Inch cord. There are two slot holes on the rear which allow you to mount the unit on the wall. It is 1200 joules rated surge protector which makes it ideal for home and office use. It has six swivel outlets which crease convenience. There are both 2.0 and 2.1 USB port which are useful in charging you devices. This unit is designed with a wall tap for mounting. Its ideal for protecting your computers, stereos, printers and other electronics. This is made possible by the MOV technology which takes care of lightning surges and line abnormalities. All unwanted noise if is blocked by the EMI/RMI filters. This unit comes with a limited warranty which offers confidence when making a purchase. 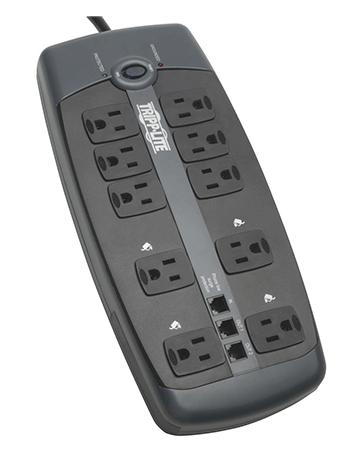 Tripp Lite TLP1008TEL is an affordable AC surge protector. It comes in handy when protecting your working station, computers and other home electronics. It has 10 outlets and comes with a 96-Inch cord. These allow you make bulky connections. A right angled plug also saves your space. LED indicators are provided to signal surge damage. With an exceptional suppression rating of 2395 joules, this surge protector shields all your equipment with strongest power surges. It also provides noise protection with regards to radio and electromagnetic waves. A special built-in RJ11 protects your modems and phones against surges. 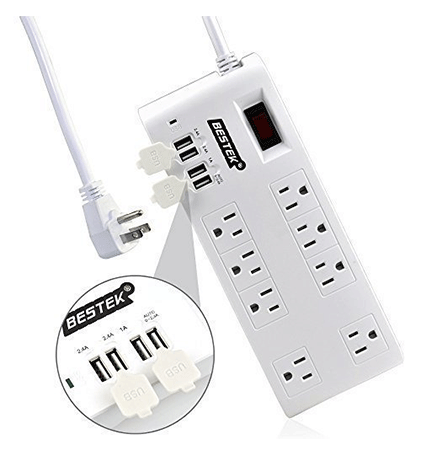 Bestek comes with a 70.8-Inch power cord and four USB charging ports. The former allows you to make connections that encourage appliance accesibilty. The former allows you to charge you personal devices. Its heavy duty design provides protection and ensure uninterrupted power flow. Bestek has been upgraded to block noise. 8 outlets are ideal for both home and commercial uses. 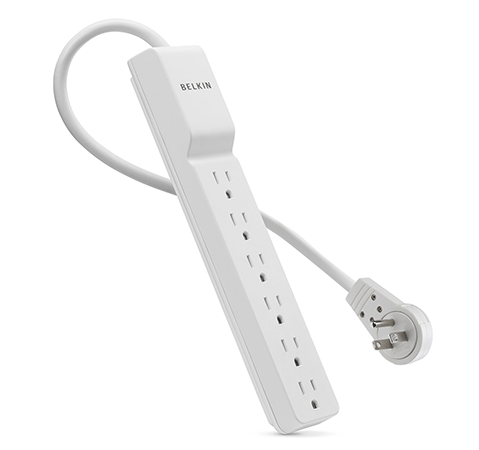 This surge protector is easy to use with slots for hanging on the wall. There is an inbuilt circuit breaker which protects USB devices. It is ETL certified for safety. 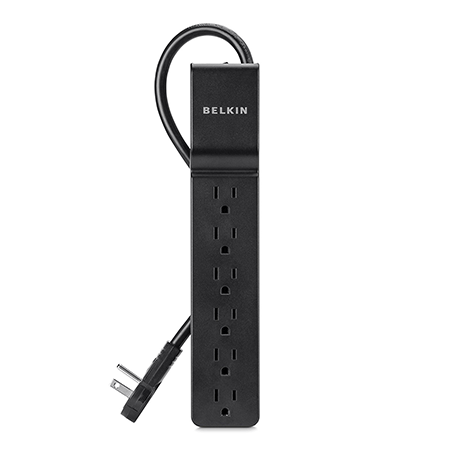 This Belkin model comes with a 24-Inch heavy duty power cable. The whole unit is designed to save space for your furniture and other home equipment. 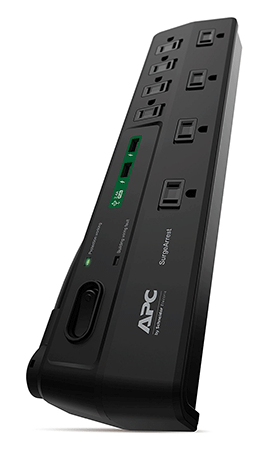 This slender surge protector is ideal for home, entertainment center and office use. 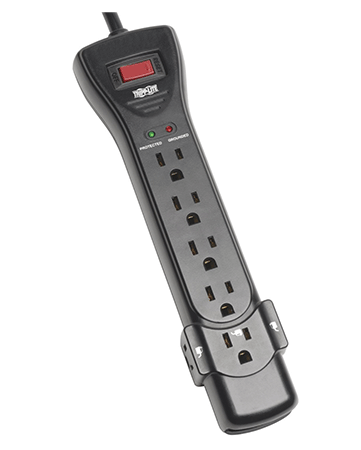 6 outlets offer protection to a wide range of devices like radios, computers, cell phone chargers and other electronic devices. A built-in voltage sensor allows the unit to respond to the needs of your devices. MOV technology protects your circuits from fire, rust and impact as well. The 200 joule rating provides enough safety against faulty lines and lightning. Two power strips provides protection to your devices located on various places. USB charger slots are provided for all your mobile devices. This protector utilizes the P11U2 surge arrest technology to protect you appliances from power interruptions and lightning. It is designed by designers who are known to provide reliable and safe protection. There equipment policy provides for a lifetime warranty. 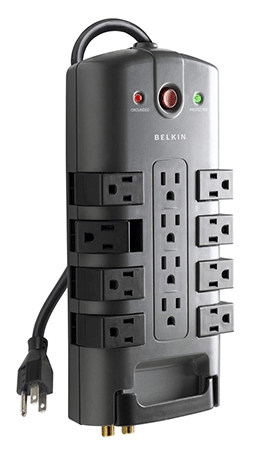 It comes with 6-transformer and 5 regular spaced outlets which increase flexibity. A 180 degree rotating power cord provides flexible installation. This unit also comes with EMI/RFI noise filters. Three LED indicators signal wiring issues and overloads. It is a 790 joules rated power strip which ensures protection against power interruptions and lightning. This 3 phase surge protector is ideal for small home appliances. These include phones, lamps and iron boxes. A 72-Inch long is provided for distant connections. A red LED light indicator signals for surges and faulty circuits. Amazon basics provides a 15-Inch Amp circuit breaker which promotes safety. Ideal for small appliances, long cord provide devices accessibility, LED protection signals, enhanced circuit safety. Belkin Surge Master is rated 1045 joules. It offers a wall mount direct plug which saves your office or home space. It takes care of your computers, modems, kitchen appliances and other standard household appliances. This protector comes with 6 oulets which allows for multiple connections. It comes with a line splitter and EMI/RFI noise filters. The latter are capable of up to 43 dB noise filtration. Belkin 720-joule protection keeps your devices safe for power spikes and surges. It comes with a rotating plugs with 360 swivel capabilities. 6 outlets are provided for multiple household electronics. These include printers, modems and entry level computers. The installation process is very simple, all you need is to plug this compact device and you are done. 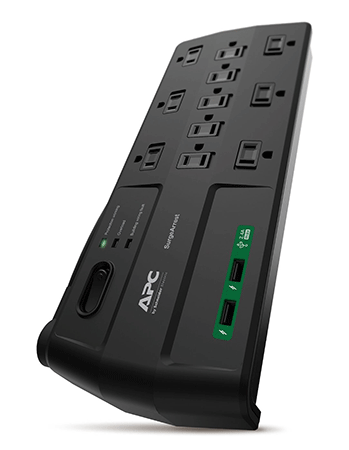 A 96-Inch long power chord ensures that you connect multiple devices. It also comes with a noise reduction technology. 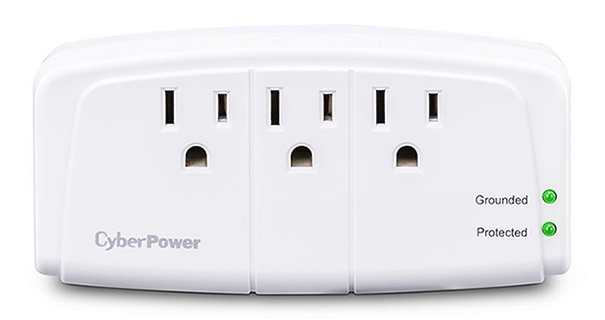 This 12-Outlet surge protector allows you to connect more devices compared to other models. It has a tremendous rating of 4320 joule which grantees protection to both small and highly rated appliances. These include home theater stems, household electronics, printers, workstations and more. It comes with a cord management system which helps in keeping you home or office clean. A rotary cable design provides more room for appliances and furniture.